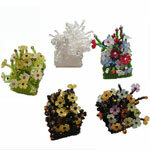 Some of our creations that have been published have kits available in the store. Some of our designs are strictly for inspiration. 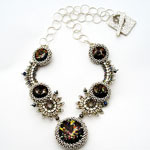 Supernova necklace was published in Bead and Button as a feature project. The pattern is available here for purchase. No kit for this necklace. 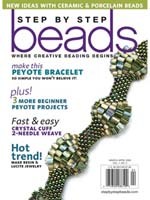 Lucies Pearl Cuff displayed with kit on page 52. 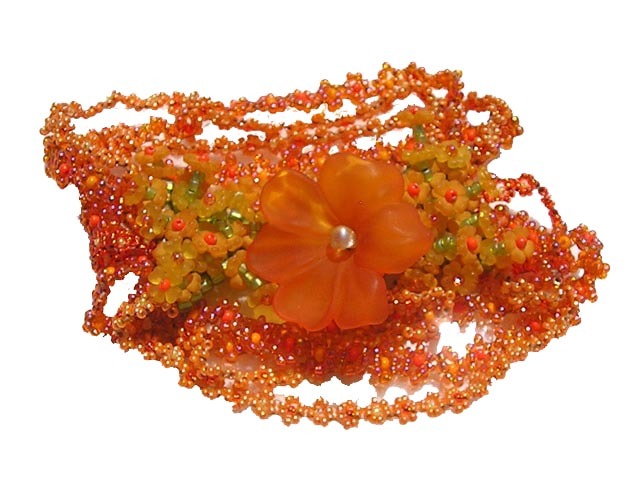 This bracelet is functional and great looking with lucite flowers down the center. The kits are available for purchase here. 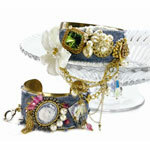 The Pearlvescent bracelet kits are available for purchase here. 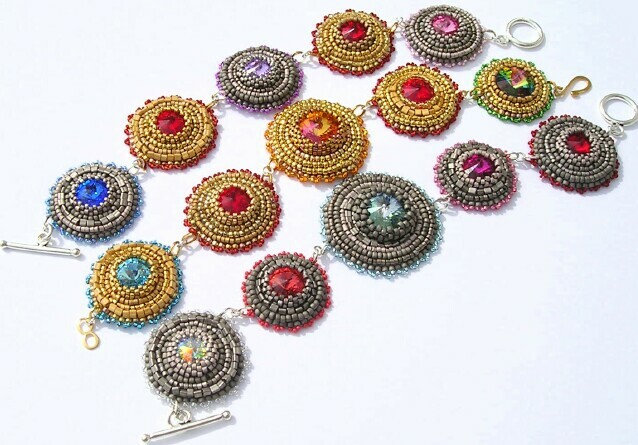 These are glamourous little bracelets that look astonishing on your wrist. The Phalange Plot or Fairy's Garden ring ia a perfect little fringie finger adornment. This ring is on page 8 of the spring issue of Bead Unique. Kits are available on the website here. Cassiopeia featured on page 8 in Bead Unique is a perfect new way to hold a Rivoli in with bugle beads. Check it out this one ROCKS! The bracket that hooks the cup to the chain is very innovative. See the Rivoli's on our website under Swarovski. Patterns are available on the website here. No kit for this necklace. 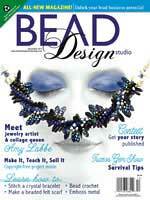 Bead&Button Magazine October 2010 and the Creative Beading Volume 7 - Kalmbach Publishing 2012. 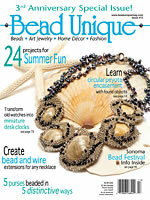 Featured project - Bring-it (ring) page 192. 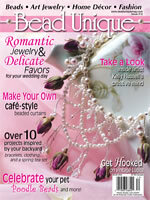 "(B)ring it" is the newest publication in Bead and Button Magazine! 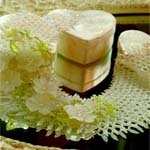 This is an elegant lightweight ring made of Lucite leaves that makes the ring look like a flower on your finger. Check out the kits on the store page here. 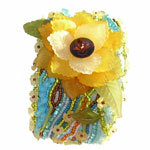 Summer's Gate bracelet was voted #1 in the glass category! Thanks to all that voted! No kit for this bracelet. Tuscan Tiles bracelet using Swarovski crystals and copper beads to make a fantastic bracelet design for your wrist. Kits for this project are available on the website here. 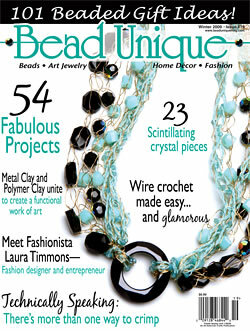 Material Girl is our second cover with Bead Unique Magazine! 1.5" Cuff blanks and the Lucite for this project are available on the website here. The pattern can be purchased here. No kit for this necklace. Lucies' Day in the Sun can be downloaded free on the Beading daily site by clicking on the image to the left. Enjoy creating your own Lucies' Day in the Sun, we sure did! 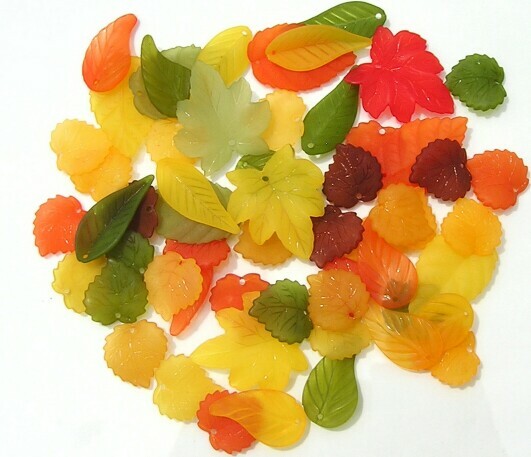 Lucite items you will need are: 46 D_F95 (6mm) flowers, 2 D_F33 (10mm) flowers (the pictured flowers are discontinued), 18 D_L63 leaves (15mm), 4 L_45 (10x18) leaves, 1 D_L02 (12x28) leaf and 2 D_L60 (17×30) leaves. Kit may soon follow until that time all the Lucite can be found here under their respective category and then item name. Cuff blanks are available under Metals Category. Ultra Suede is available under supplies. 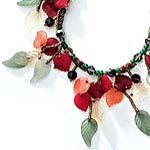 Don't forget the seed beads. 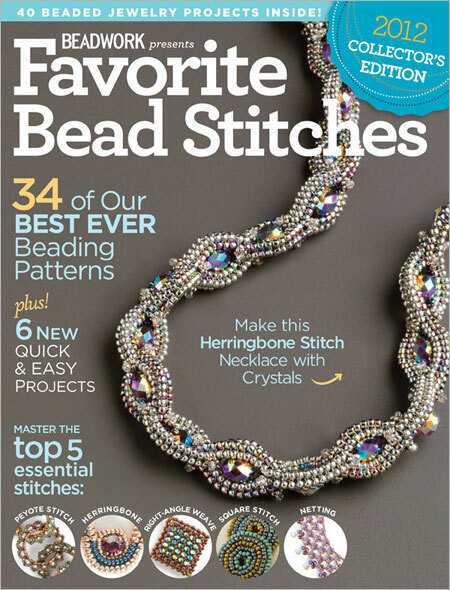 Instructions can be found on the Beading daily Site. No kit for this necklace. Our Beaded Book "Flowers for Algernon" made the top 20. 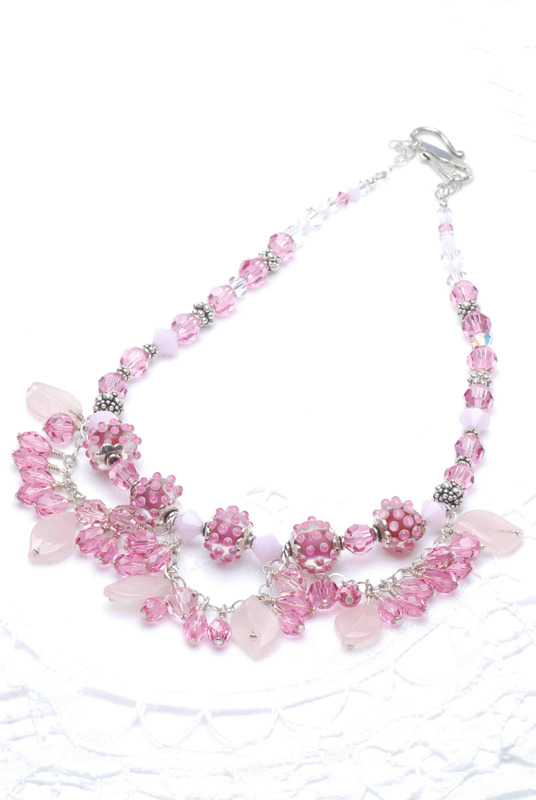 Lucie's Branching out is a wonderful example of Lucite usage in a fun necklace. Kits for this project are available on the website here. 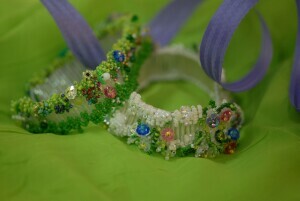 Blossoming Bride, a delicate weaved design with Swarovski and seed beads. The bracelet and earring project is located here. 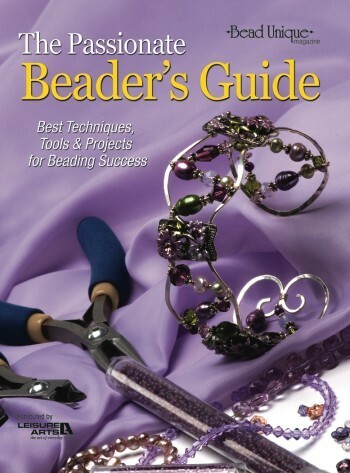 Our projects "Interchangeable Faux Cuff" is featured on page 21 and "Gilded Blossoms" is featured on page 53 of this issue of Bead Trends magazine. Both are a free project that can be downloaded here. 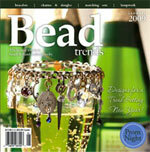 Our project "Lucy, You're so Charming" is featured in this issue of Bead Trends on page 97. Pattern available here for download. 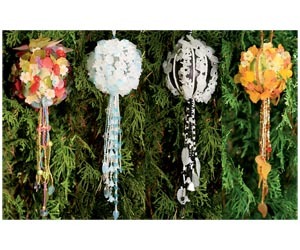 "Ornamental Garden" which we call Lucies' 1st Christmas Ornament. Lucite kits for this project are available on the website here. 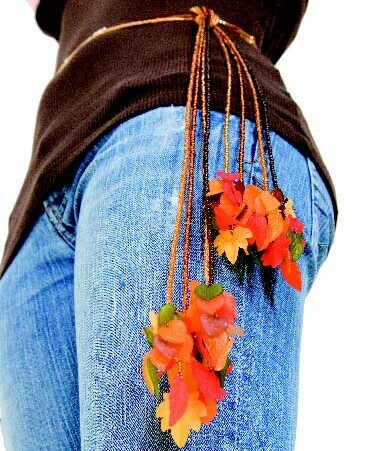 Ode to Autumn Lucite for the belt can be found on the store's kits pages. 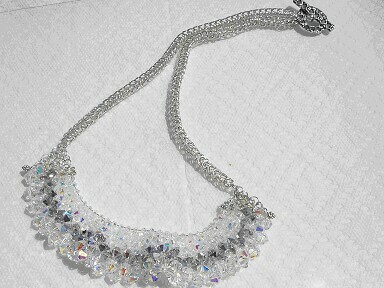 Crystal and Chain necklace. No kit available for this necklace. Bead Unique Issue 17 Summer 2008 Page 22. 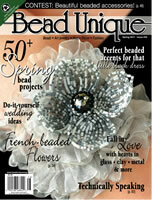 Our beautiful bracelet featured on the cover of Bead Unique! No kit available for this necklace. 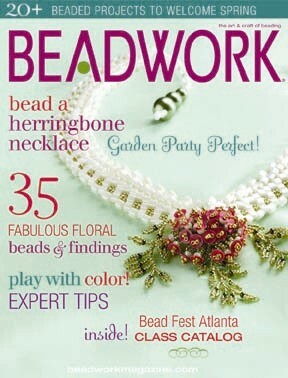 Lucies' Daisy Patch featured on the cover of Beadwork! Kits for this project are available on the website here. 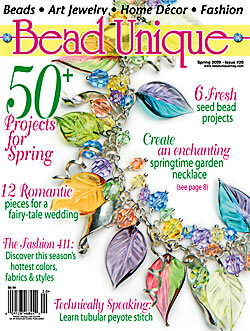 Lucies' Garden Bead Unique Magazine See pages 44, 45 and Gallery on 102. Lucies' Garden on page 44 and Rose Wedding in the Gallery section. Lucies Garden kits available here. 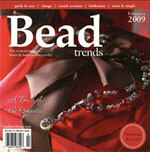 April 24th 2007 in Bead Unique Issue #13. On pages 26, 27, and 28. 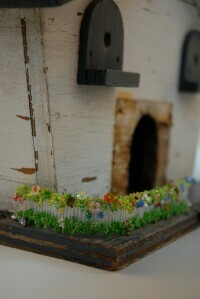 Picket Fence kits available here. Summer 2007 Lucies' Garden was published again in the Passionate Beader's Guide. 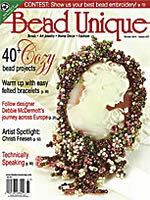 February/March 2008 issue of Bead Work Magazine Volume 11 #2. Romantic Ruffle. No kit available for this necklace. 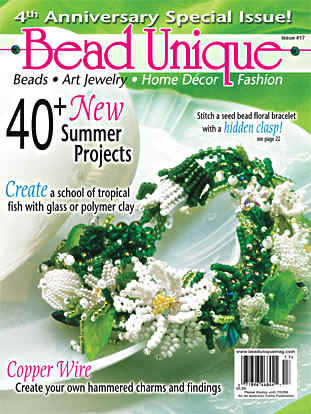 April/May 2007 issue of Bead Work Magazine. 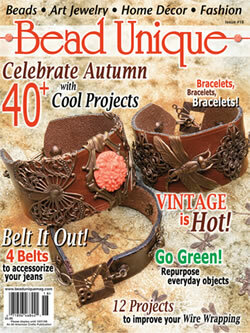 Pretty Parterre Bracelet see pages 42-44.